Summary : This bi-level hot spot in the heart of Via Tribunale - one of the main drags in Naples - is always crowded. Their pizza isn't Naples best, but it's pretty darn good and must-visit stop on any tour of pizza places in town. During my fourth and final day in Naples, I took a break from pizza related activities until dinnertime. I spent the afternoon climbing up Mount Vesuvius — a spot in which vegetables such as tomatoes benefit from the high concentration of minerals of the rich lava soil. 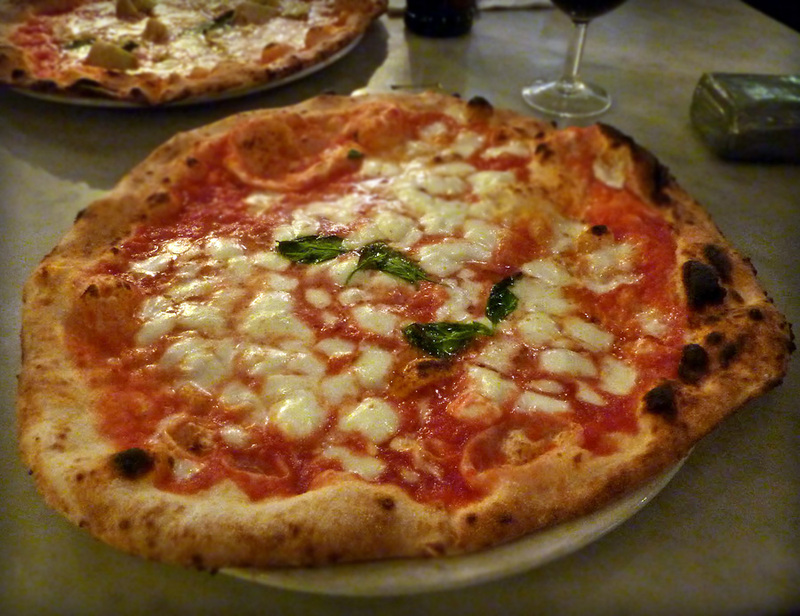 There are many arguments as to what makes the pizza in Naples so great. And it is generally believed that part of the reason is because of the flavorful tomatoes the region is able to produce. Having had little to eat all day, I was excited to pay a visit to Sorbillo (32, Via Tribunale, 081-446643) which is located down the block from Di Matteo where I’d eaten the previous evening. When we’d passed by Sorbillo the night before (Friday), there were dozens of people waiting to be seated around 9PM. We figured we’d try to beat the Saturday night crowds and get there when they opened around 7:30PM. When we arrived, it appeared that the restaurant had started seating parties prior to 7:30PM, so take their hours as flexible. Luckily, though, we did not have to wait for a table. Sorbillo is set up in a similar fashion as Di Matteo with the oven and a dining room on the first floor and multiple dining rooms on the second floor. Sorbillo, however, is the fancier of the two. The place was more dimly lit than any other pizzeria we visited and is adorned with artwork and artifacts rather than newspaper clippings and photographs. 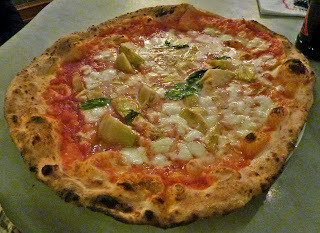 Sorbillo — to be honest — was not a pizza place I’d intended to go when I arrived in Naples. But there was a lot of buzz surrounding it. The crowds I had witnessed the previous night were convincing, but I’d also been sent multiple recommendations for Sorbillo from friends and blog readers throughout the week. And finally, posters of Gino Sorbillo, like the one below, were plastered all around town. Thus, Sorbillo went from a potential stop to a necessary visit. A visit to the kitchen was very representative of what I found in many kitchens throughout Naples: pride. In New York City, although some pizzerias and restaurants are very welcoming, others are scared when patrons whip out a camera. Will these photos end up on a blog? What if they’re bad quality? Is the place being reviewed? In Naples, people are so proud of their pizza and so confident in their craft that they welcome you into their kitchens as if their kitchens were their homes. They pose for photos with their pies, like artists showing off their masterpieces. I was hoping that the pies tasted as good as they looked… and they sure did. 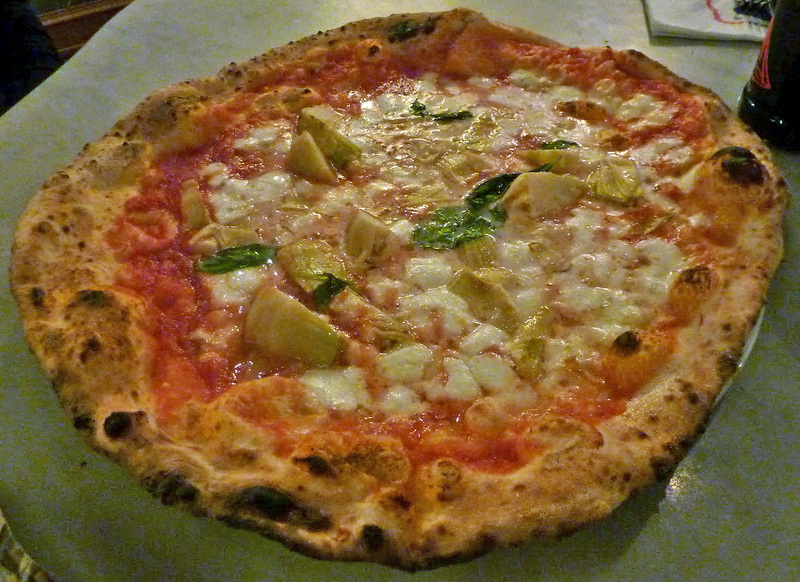 Nice and chewy, the fresh mozzarella combined with the sauce for a a top tier Neapolitan pie. The Margherita pie (€3.30, about $4.50) was superior to the Elena pie (€4.80, about $6.50) which featured artichokes — although the artichokes were more flavorful than veggies we had on pies at other places. The crust, in particular, stood out with it’s airy texture. You can see more bubble action going on here than anywhere else. As it was my last night in Naples until I would return at the end of my trip (I was off to Rome and Barcelona for a week), we capped off our meal with some limoncello (€2.00, about $2.50) and a chocolate, tiramasu-like dessert (€1.70, about $2.00). Every meal should end this way. Although Sorbillo wasn’t my favorite place in Naples, I thought it was better than Da Michele and Di Matteo — two places with which it should be compared. They’re all in the center of Naples a few blocks from one another, attract a mix of locals and tourists, and have a long history of making pizza. In other words — they’re institutions. After heading back to the hostel, it was time to take my appetite to Rome, where I set out to find pizza that lived up to that in Naples.